Beverley is a Solicitor within our Family Law team. 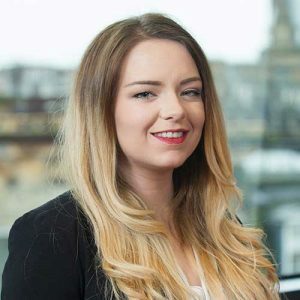 She qualified in 2017 after completing a specialised traineeship in Family Law with BTO where she gained experience dealing with all aspects of family law in both the Sheriff Court and Court of Session. Beverley is experienced in dealing with all aspects of family law including financial provision on separation and divorce, cohabitation and cases relating to children. She has a particular knowledge and interest in the law surrounding assisted reproduction, being well known for her knowledge of the law of surrogacy and IVF in particular. Beverley is warm and approachable with clients and is able to make the law easy to understand. She is pragmatic about negotiating results for clients which avoid the stress and expense of a court action, but is a tenacious litigator when required. Beverley has first-hand experience of the impact that marital breakdown can have on children of a marriage through her previous employment as a youth worker. She brings that experience with her to BTO, ensuring that all cases which involve children have a child-centred approach. During her training at BTO Beverley also spent 6 months working for our Corporate department. This gives her a unique understanding of the corporate implications of a separation where family-owned businesses are involved. In her spare time Beverley enjoys all things sporty and plays rugby for Greenock Wanderers.